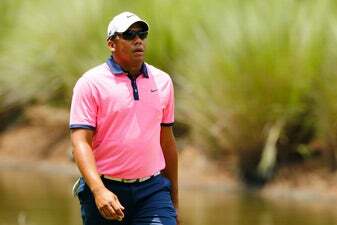 OAKVILLE, Ontario (AP) -- Jhonattan Vegas successfully defended his RBC Canadian Open title Sunday at Glen Abbey, beating Charley Hoffman with a birdie on the first hole of a playoff. Vegas' approach from the left bunker on the par-5 18th hit the grass just above the sand lip and still had enough power to clear the water and go through the green. "When I heard the clip, because obviously I didn't see it, I knew that it was probably going to go in the water, because I didn't know exactly how hard it hit it," Vegas said. "But then when I saw the ball in the air, it was still going really hard and forward." The 32-year-old Venezuelan chipped to a foot - after racing a chip past the hole in regulation from the same area en route to a par - and won when Hoffman's birdie try from the back bunker slid past the hole. "It's been a special day," Vegas said. "I knew that I had to shoot a good round today to have a chance to win again. I just came out with an aggressive mentality, just feeling really good about my game. When I started making a few birdies, especially the putt for birdie on 7, I started feeling the same chills that I felt last year when I won, and I just knew that something good could happen if I kept that going." Vegas closed with a 7-under 65 to match Hoffman at 21-under 267. Vegas is paying close attention to the turmoil in Venezuela, where people stayed away from the polls in massive numbers Sunday in a show of protest against a vote to grant President Nicolas Maduro's ruling socialist party virtually unlimited powers. "It's been on my mind. It's always on my mind," Vegas said. "I have family that live there. It's my country of birth. I mean, it hurts. Like I said yesterday, it hurts a lot, seeing the country the way it is; seeing a government that treats people that way when they don't deserve it just to remain in power, and all the suffering that even my family and friends that are having right now, it's just not fair." Hoffman, the third-round leader, birdied the 18th for a 68. "I gave myself a chance, except I putted horribly today and left everything short," Hoffman said. "Jhonny played great today. All credit to him." Hoffman left a 15-foot eagle putt short on the par-5 16th, then had a 10-foot birdie try on the par-4 17th and a 20-footer for eagle on 18 go by the left edges. "It's always tough after you don't close the deal after having the lead," Hoffman said. "Seventeen, I hit a great putt. Actually thought I made it," Hoffman said. "That green was a little burned out. Thought I made that putt on 17. Eight-teen, I hit a good putt. Sixteen, is the one I want back, right in the jaw strip. Didn't get there." Vegas has three PGA Tour titles, also winning the 2011 Bob Hope Classic. He's the sixth player to win consecutive Canadian Opens, following J. Douglas Edwards (1919-20), Leo Diegel (1924-25), Sam Snead (1940-41), Jim Ferrier (1950-51) and Jim Furyk (2006-07). Ian Poulter was a stroke back after a 64, the best round of the day. "The best thing I did today was start holing a few putts," Poulter said. "I played good golf today. I gave myself a lot of chances. I'm going to rue a couple of chances out there on the golf course, 13, 16, where I felt I had opportunities to add to my under-par tally." Gary Woodland was 19 under after a 68. Robert Garrigus shot a 69 - a day after matching the course record with a 62 - to tie for fifth at 18 under with Brandon Hagy (68) and Tony Finau (68). Top-ranked Dustin Johnson (67) and Kevin Chappell (71) were 17 under. "The golf game is there," Johnson said. "I'm really hitting it well. Feel like I'm driving it better today a little bit. I hit a lot of really good putts that didn't go in the hole. I had a lot of looks today, and it's definitely positive." Vijay Singh, at 54 the oldest player in the field, closed with a 68 to tie for 14th at 15 under. He won the 2004 tournament at Glen Abbey, beating Canadian Mike Weir in a playoff. Matt Kuchar had a 69 to tie for 32nd at 10 under. Coming off a second-place finish in the British Open, he fought dizzy spells in the first round Thursday. Mackenzie Hughes was the top Canadian, shooting a 68 to finish at 10 under. Graham DeLaet, the only other Canadian to make the cut, tied for 48th at 8 under after a 71. Vegas jumped from 17th to 10th in the International standings for the Presidents Cup.